You are at:Home»Deals»Web Hosting»1and1 | 1&1 Coupon Code | Beware Fake Promo Codes In April 2019! Are you a website owner on a really tight budget? I have good news for you! 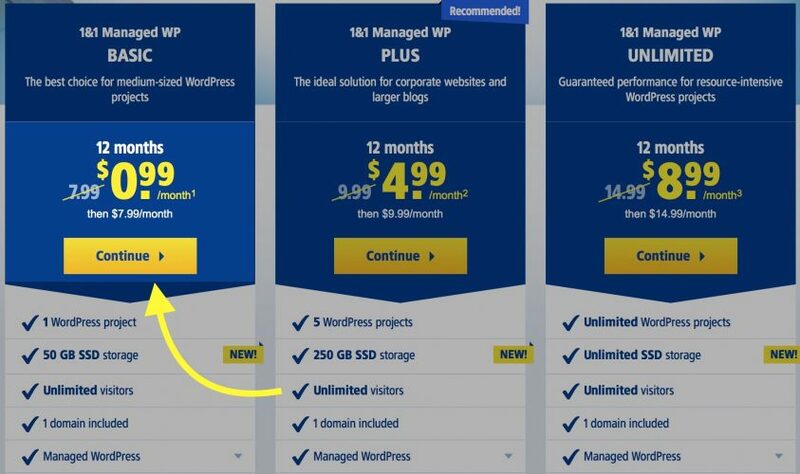 We’ve found an awesome 1and1coupon code working in April 2019 that will help you get awesome WordPress web hosting for less than a dollar per month! Some hosting plans can costs dozens, if not hundreds of dollar per month, so when people see a deal like this, they may think it’s too good to be true. Pinch yourself — WordPress hosting for 99 cents per month can be yours with our 1&1 coupon code that’s working in April 2019! 1&1’s best promo code will save you over 87% on web hosting plans. You can get top-tier managed WordPress hosting for just $0.99 / month, which is a lot cheaper than their normal price of $7.99 / month. Click this link to visit the 1&1 website. Choose the Managed WordPress Basic plan. Our 1&1 coupon code has been applied automatically. Redeem your free domain (website address), or click Proceed without domain if you already own a domain. On the checkout page, make sure you have selected 12 Months as the Contract Duration. Our 1&1 coupon code only applies to the 12 month contract duration. Decide if you want to add any add-ons to your purchase. We do not recommend purchasing these add-ons yet. If you ever change your mind, you can always upgrade to these features later on. 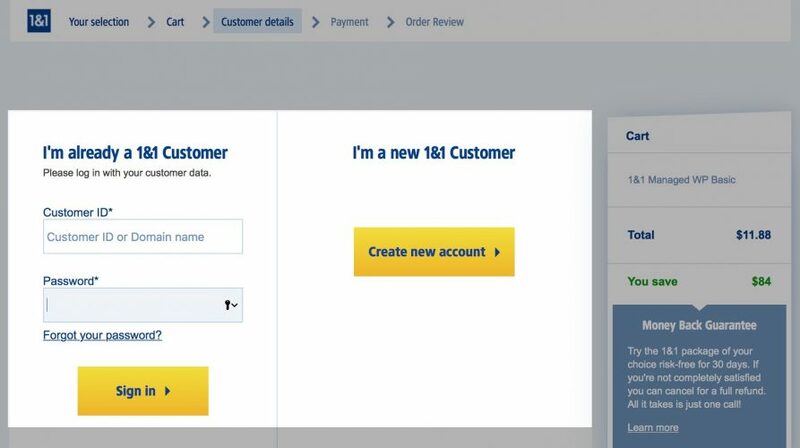 Sign-in to your 1&1 account or create a new account. If you create a new account, enter your billing information, choose a password, then click Continue to payment information. Enter payment information, then click Continue to Order Review. On this page, confirm that all the information is correct! What Does My 1&1 Hosting Plan Include? Other than the free domain, your 1&1 hosting plan will include 50 GB of SSD storage space, pre-installed WordPress plugins, automatic WordPress updates, unlimited email accounts, staging websites, and more. These plans also include an SSL certificate, which helps protect the your website traffic’s personal information. If something ever goes wrong with your website or hosting plan, 1&1 offers 24/7 around-the-clock support! They have a whole dedicated team of WordPress experts who can help you solve any problems you may come across. You’ll also have access to the 1&1 community, where you can interact and share ideas with other website owners. Don’t Want To Use WordPress? That’s OK! If you’re not a fan of WordPress, our 1&1 coupon code also applies to regular web hosting. After clicking the link in Step 1 above, simply scroll over Website Builder & Hosting in the menu bar and click Web Hosting. As you’ll see, the Basic web hosting package is also 99 cents for a 12 month sign-up! Standard 1&1 web hosting plans include 100 GB of storage, 500 email accounts, 1 GB of SSD, a free domain, an SSL certificate, and access to 1&1’s 24/7 support team. Our 1&1 coupon code makes hosting as easy as hitting a free throw! We know these fast and affordable plans will help your website reach the next level. Get started today and leave us a comment below to know how it goes! 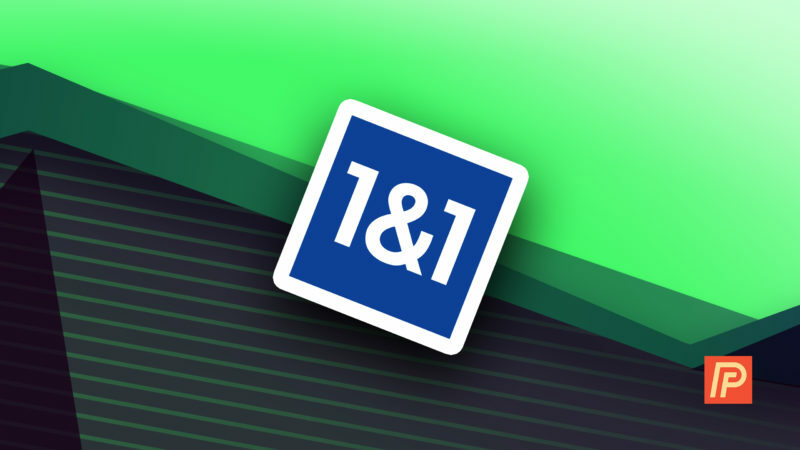 1&1 equals less than $1 / month for website hosting. Note: We may receive a referral fee from 1and1 if you make a purchase after clicking a link on this page. Previous ArticleSiteGround Promo for 70% Off in 2019 | No SiteGround Promo Code Or Coupon Code Required! Next Article iThemes Hosting Coupon Code April 2019 | Save 40% On Your Web Hosting Plan!